taken 2004 isle of wight. Editor note: Does anyone knows what kind of tank this is? Added by Roger Greenaway on 17 September 2010. Should it not be FV214? Added by AlfvanBeem on 17 September 2010. "There used to be a Conqueror at Base Vehicle Depot Ludgershall - a gate guard named William." Added by Kreuzerkrieg on 17 September 2010. You are right FV214 - a bit of dislexia in my typing fingers!! Added by Roger Greenaway on 18 September 2010. This Conqueror is the one from Ludgershall, it's now inside awaiting restoration. Added by Roger Mason on 29 January 2011. 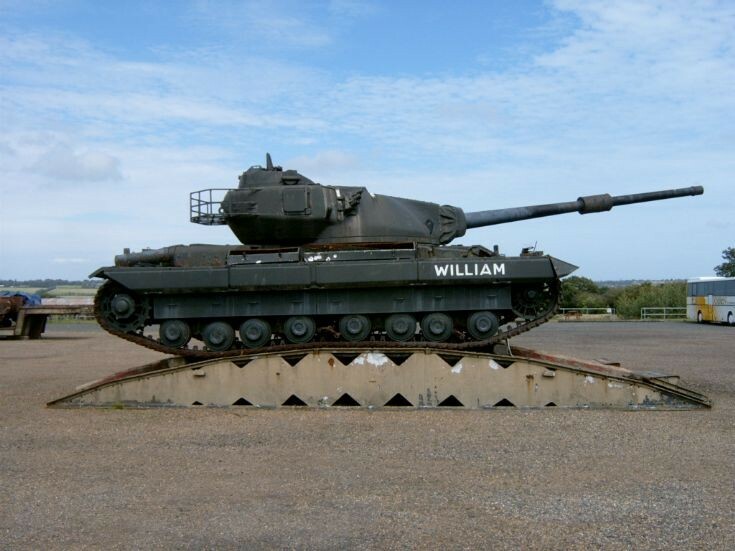 I think there was a 2nd Tank at Ludgershall along with william, any ideas what it was/it's name, please ?. Added by Dave on 25 April 2012. It's certainly a Conqueror, and a severe test for a fairly old bridge! Added by John Harris on 29 April 2012. They were all given names but I cant remember the names of the Alvis AFV's. I was a regular visitor to the depot for 6 years during the late 1980's. Tank transporters were not allowed to use the bridge or travel through Ludgershall they could only get to the depot by using the road from Tidworth. Added by Stephen Prosser on 15 October 2013.